We’d like to announce a great new way you can support Groton Animal Control. Adrienne Pratt, a longtime supporter of GAF, has set up a website for her business, Porkchopstick Studios. Visitors can make donations through the site, and profits from the sale of some items will also be donated. The site features some wonderful wood cut designs, and a lovely tribute to Minnow, a cherished pet who was lost in 2014. 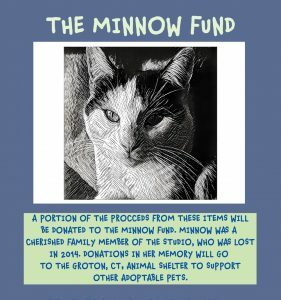 We’d like to thank Adrienne for setting up the Minnow Fund to benefit Groton animals, and to encourage everyone to check out her wonderful website.